For postcard-perfect long weekends, or full week stays that have exceptional access to indoor and outdoor pools, restaurants, and amenities, there's nothing quite like the convenience of a stay at a local Outer Banks hotel or motel. A number of hotels on the Outer Banks have been welcoming guests for decades, and as a result, vacationers have come back year after year for the fantastic service and the mile-high oceanfront or soundfront views. In recent years, a number of established chain hotels had made a claim on the Outer Banks, attracting guests with their national prestige and host of on-site amenities and concierge services. Still more have become the temporary home for a number of regional and even international conferences, including Outer Banks-wide celebrations like the Taste of the Beach Event or the annual Wedding Expo. But vacationers who don't need all the fuss and just want a quiet room to retreat to after a full day in the sun will find plenty of options available as well, with small mom and pop establishments that offer incredible beach access, on-site amenities such as community pools, hot tubs, or even mini golf courses, and an accommodating staff that is ingrained with Southern Hospitality. Intrigued? Review the following Frequently Asked Questions regarding a stay at a local Outer Banks hotel or motel to learn more, or simply call up your favorite local lodgings for more information. For a classic beach vacation that is simply (or exquisitely) Outer Banks, a leisurely stay at a local hotel or motel might be just the ticket. How do you book an Outer Banks hotel or motel? With the exception of a few small and well-loved hold outs, the majority of hotels and motels on the Outer Banks have detailed websites with online booking services available for guests' convenience. With just a few clicks, guests can effectively view room photos and locations, area maps, featured amenities, and availability. National chains may not have area-specific websites, but by entering your preferred locale, (namely Outer Banks), and conducting a quick search, internet browsers can easily find beachside accommodations. Be prepared to have a credit card handy to secure the reservation, and pay careful attention to the hotel or motel's cancellation policies. While most regions of the country generally accept cancellations up to the day of arrival, many Outer Banks lodgings, due to their coastal locale, may require at least 24 hours advance notice in the event of a cancellation. Several hotels and motels may also require that summer weekend guests stay for two nights, with a Friday check-in and a Sunday morning departure. However, most Outer Banks vacationers do not find this to be an issue, as a long weekend on the OBX can be a complete breath of fresh air. When should you book an Outer Banks hotel or motel? Where are the local Outer Banks hotels and motels located? Virtually every area of the Outer Banks has a collection of hotels and motels to choose from, and potential guests will find everything from small, 1-story family-friendly lodgings to exclusive resorts in most every town. The hotels found in the northern Outer Banks towns of Duck and Corolla are practically designed with luxury in mind. In these towns, vacationers will find invitingly charming inns, and exquisite resorts that feature fine dining restaurants and popular spas on site. Corolla, especially, is known for luring visitors with affluent tastes, and guests will find several chain hotels as well as regionally renowned resorts that have attracted luxury guests for decades. 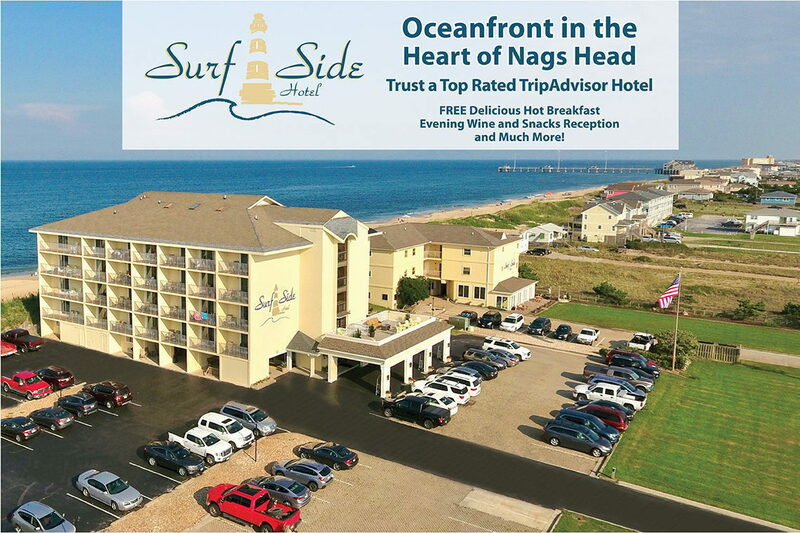 For variety and a large number of options, hotel and motel guests should concentrate their search in the central Outer Banks towns of Nags Head, Kill Devil Hills and Kitty Hawk. The Outer Banks' most populated communities also feature the largest number hotels in one concentrated area, and visitors will find a wide selection of oceanfront and beachside accommodations to choose from. The majority of hotels in these towns are, in fact, located right next to the beach, ensuring fantastic ocean views and step-out-the-door beach access. Accommodations range from small mom and pop motels that have been fixtures on the North Carolina beach scene since the 1950s and 1960s, to large, multiple-story hotels that feature private oceanfront balconies, towering over the ocean waves. Day trippers who spontaneously decide to spend a night should take a drive down the Beach Road, the original road that ran through the three coastal towns, and currently runs parallel to the US 158 Bypass along the oceanfront. Here, they'll spot a dozen motels and hotels, with available vacancies listed on their roadside marquis. Manteo, located just off the beach, has a hotel culture all its own. Vacationers may not find any national chains in these parts, however, they will find a variety of motels and hotels that have been serving up fantastic vacations for generations Located both along the main route through Manteo, on US 64, or tucked beside the waterfront near the historic downtown, the Manteo accommodations are renowned for their friendly service, fantastic amenities, and proximity to some of the Outer Banks' most loved attractions, including the Elizabethan Gardens, the North Carolina Aquarium, and the Lost Colony outdoor drama. Hatteras Island is another Outer Banks locale without any national hotel chains or multi-story structures, and seasoned vacationers couldn't be happier about it. On Hatteras Island, vacationers will find small, established motels and hotels that offer exceptional beach access, stunning waterfront views, and friendly staff that have most likely been manning the front desk for decades. Buxton Village has the largest concentration of hotels and motels, with many offering direct beach access, ocean views, and lots of local hospitality. Water lovers will also adore the village of Hatteras, at the southern end of the island, as the majority of motels and hotels here feature fantastic harbor front or soundfront views. Several small hotels lie adjacent to the marinas that line up against the Pamlico Sound-bordering harbor, so visiting mariners can pull up their boat, drop anchor, and enjoy a restful night's stay in a comfy, soundfront room. Even further south, Ocracoke Island features a small collection of hotels and motels as well, scattered throughout the small village, and bordered by 13 miles of undeveloped shoreline and maritime forest. Accommodations on Ocracoke Village can be found right off the main drag of NC Highway 12 as you enter the town, or bordering the harbor front with Ocracoke's favorite restaurants and marinas as neighbors, or even virtually hidden along small, wooded side streets. Like Hatteras Island, there are no towering hotels or national chains to be found, however, Ocracoke vacationers will still find plenty of variety in the local hotels and motels available. From small, budget friendly motels that have been in business since the 1930s to gorgeous harbor front accommodations with private balconies and hammocks included with every room, the selection on Ocracoke Island is surprisingly wide and varied. Unlike other regions, however, Ocracoke accommodations tend to fill up very quickly, particularly on long weekends and during the popular summer weeks. Ocracoke lovers are encouraged not to wait until the last minute, but book their accommodations as soon as possible. The reward will be a relaxing stay in a quaint but charismatic hotel or motel, that's near all the amenities, restaurants, and attractions that Ocracoke has to offer. After all, with only 4 square miles of village to explore, virtually every vacation destination on Ocracoke Island is close to all the "action." What amenities are available with an Outer Banks hotel or motel? The amenities available for Outer Banks hotel and motel guests are varied and can include the basics, such as a comfy bed and cable TV, or the elite, such as spa services and a world class breakfast in bed. Basically, with the wide selection of accommodations available, an OBX vacation stay can be as simple or as elite as a vacationer desires. Many of the hotels and motels on the Outer Banks offer private pools to their guests, and / or direct beach access for a quick, refreshing dip in the ocean. Guests should note that with the exception of hotels that feature indoor pools, the majority of pools are only open from late spring until early or mid-fall, when the water temperatures are refreshing and not too chilly. Obviously, vending machines and snack bars are readily available, and the more elite or strategically located hotels and motels, (like in Hatteras Village or Ocracoke), offer on-site or neighboring restaurants as well, making an evening dinner out a breeze. The majority of hotels and motels on the Outer Banks also offer kitchenettes, with mini-refrigerators and microwaves for quick, no-frills cooking, and some motels that are accustomed to weeklong vacationers may even feature suites with multiple bedrooms and full kitchens, allowing guests to enjoy relaxing and budget-friendly meals at home. These same establishments may feature community or in-room laundry facilities, community lounge areas, or even game rooms for a little fun out of the sun. Be sure and ask your local accommodations provider what amenities are included or available to ensure an easy, stress-free vacation. If your vacationing party has something special in mind, whether it's access to beach toys and water sports gear, or an on-site oceanfront bar for after dinner drinks, the best way to find out if your preferred hotel or motel can cater your needs is to ask. After years of successfully providing fantastic beach vacations, many local hotels and motels are experienced in catering to vacationers, and providing them with exactly the amenities and services they need. Any tips or tricks for staying at an Outer Banks hotel or motel? For a completely stress-free vacation, visitors who are staying in a weekly vacation rental may want to consider enjoying a night before their check-in date, or after their check-out date, at a local Outer Banks hotel or motel. Check-in days for vacation rentals, which most always fall on a Saturday or Sunday, can be notoriously tricky drives in the prime summer weeks, with traffic jams a regular occurrence on both the main US 158 Highway and NC Highway 12. To avoid the gridlock and begin your vacation with a quiet evening on the beach, consider a stay at a local hotel or motel the night before your arrival. This way, it's easy to relax and get into vacation mode well before you check into your vacation home. A number of hotels and motels offer special packages to lure their guests into enjoying an extended beach stay. These packages can include tickets to locally renowned events, like the annual Taste of the Beach in March or the Bluegrass Festival in October, discounts on spa services, or complimentary amenities such as free breakfasts, premier cable channels, or free Wi-Fi. Large parties, such as wedding parties, will find even deeper discounts with many hotels happily opening their doors to guests of an Outer Banks destination wedding. Be sure and ask in advance if your hotel or motel of choice has any special promotions or packages available, and don't forget that typical hotel discounts, such as AAA rates, can apply on the Outer Banks as well. Need a quick getaway on a budget? Plan an off-season stay. Many hotels and motels may be booked during those sunny June, July and August months, but the Outer Banks' worst kept secret is the allure of the off-season, when traffic has slowed, the majority of local restaurants and shops are still open, (especially in the central Outer Banks towns of Nags Head, Kill Devil Hills and Kitty Hawk), and the weather is still a breezy, sunny paradise. Rates go down significantly in the off-season, and weekend vacationers will enjoy plenty of privacy and all the attractions the Outer Banks has to offer. Still need your summer fix? Then plan a stay mid-week vacation, from Monday - Thursday. A number of hotels and motels offer slightly lower rates for mid-week stays, even in the prime summer season. For a quick overnight stay or a weeklong oceanfront retreat, the hotels and motels along the Outer Banks are ideal getaways. Providing exceptional beach access, convenient access to local shops and restaurants, and fantastic inclusive amenities, these establishments have been providing idyllic beach vacations to visiting families for years. Guests who want a friendly, well-loved little motel or an all-inclusive resort will find themselves well represented on the Outer Banks, and will be equally happy to discover that on the beach, friendly hospitality always comes free of charge. Just for the Beach Rentals (not to be confused with the similarly-named "Just for the Beach") offers rentals to accommodate your stay. Equipment includes linens, baby gates, cribs, monitors, seats, joggers, bikes, kayaks, skim boards, surf boards, and SUP. Free delivery is available with a modest rental order, from Corolla to Nags Head (not including 4x4 areas). 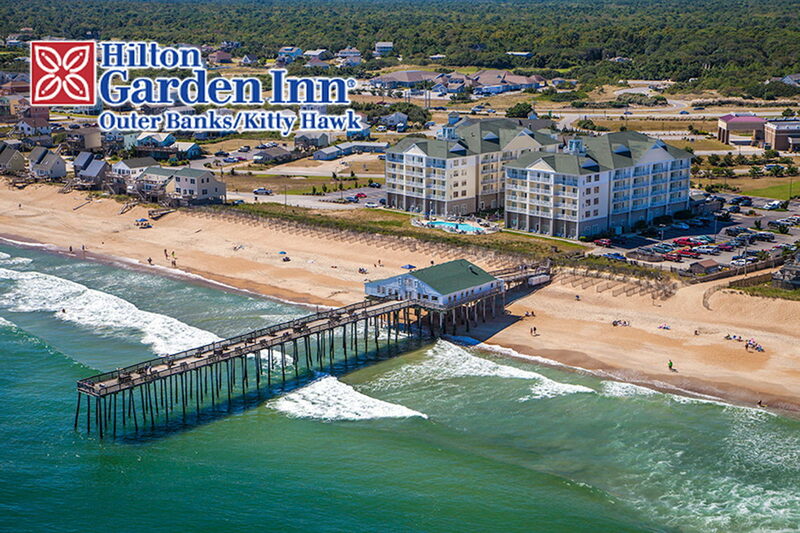 Just for the Beach offers two convenient locations in Corolla and Kill Devil Hills. Offer Valid For 10% Off Food Items Only Only Valid If Entire Party Has Ordered Prior to 2:30pm. Offer Good For Entire Party. Cannot Be Combined With Other Offers.